Other than a few catchy radio singles such as Born to Run and maybe Hungry Heart, Bruce Springsteen was never more than just another ordinary American recording artist to me. Although loved by millions worldwide, I just couldn't relate to him on any personal level whatsoever. Maybe he just oozed a little too much blue collar Americana for my Canadian blood to fully understand and appreciate what he really stood for. Either that or it was the dreadful mid to late 80's over-production era that I was mostly exposed to making it hard to take seriously, which unfortunately plagued many classic rock bands that saw better days a decade prior. I always respected Springsteen as an artist, but I only really saw him as the over patriotic “Born in the USA” guy who yanked a young Courtney Cox up on stage to cut the rug in his video for Dancing in the Dark back in 1984. That or the artist who came to the emotional rescue of the American people helping to restore faith in a nation coping with the pain and suffering in the aftermath of the tragic events of 9/11 with his 2002 album, The Rising. It wasn’t until the recent 2010 remastered boxset release of Darkness on the Edge of Town, which not only includes the original 1978 album, but consists of the two disc The Promise containing 21 unreleased outtakes from the Darkness sessions, and the documentary The Promise: The Making of the Darkness on the Edge of Town, that I finally took real notice. It is this collection that could easily make any doubter realize that not only is Springsteen not just an average ordinary American patriotic blowhard, he’s a great songwriter too. The DVD in itself outlines the entire procedure of how the album was conceived and recorded, and at times the tension between bandmates is extremely awkward and hard to watch. But it’s the vision of what the finished product became amongst a young E Street Band that is clearly documented and absolutely captivating. The Promise, the collection of tracks Springsteen left on the cutting room floor that were deemed unworthy of making the original Darkness cut, is what’s most impressive in this set. It outlines just how prolific the then 29 year-old Springsteen was back in 1978. Track highlights include Save My Love, Because the Night, and Fire to name a few. Instead he lent the scrapped aforementioned, Because the Night, to New York singer songwriter/poet, Patti Smith to see if she could make something of it, in which he was having trouble completing. Smith’s recording of the track would go on to become the biggest and only hit of the godmother of punk’s career. The track Fire which was also ditched, was handed over to The Pointer Sisters who recorded the song and went on to gain major notoriety with it scoring a number 2 hit back in 1979. 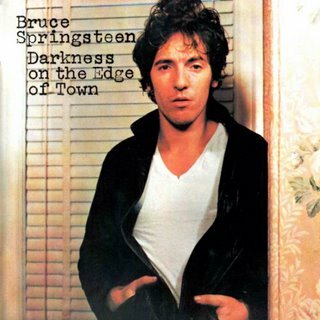 If you’re in the minority and late to the Springsteen party such as myself, The Darkness on the Edge of Town reissue is easily enough to make any doubter who never paid much attention to The Boss’ talent in the past to take full notice and fully appreciate this fine remastered pinnacle effort. And even those who are familiar with the original album in its entirety, this remastered collection and all the additional add-ons definitely make this album worth revisiting.